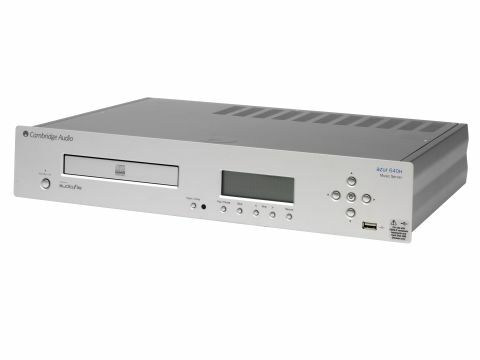 The Azur 640H follows in the footsteps of Cambridge Audio's acclaimed CD players but adds a capacious 160GB internal hard drive to centralise your entire music collection. Slip in a CD, and the 640H rips audio tracks. It can accommodate around 30,000 compressed music (MP3) tracks, which should be enough for those with an extensive music library, or 3,000 uncompressed music tracks. It takes a tedious 20 minutes to rip and store a CD using any of the five compression levels, though. Enabling the background compression mode provides quicker transfers, taking around seven minutes to store a 50-minute album, and then compresses tracks overnight while the unit is in standby. You can choose different compression formats for each CD to manage storage capacity, as well as create playlists and burn compilations to recordable discs. The 640H can access music stored on a PC or Mac as well as stream internet radio stations and retrieve music database information. You can even hook up an MP3 player via the various USB ports and transfer music from it. Disappointingly, it's not iPod compatible. Things get tricky with wired or wireless home network setup. The extensive procedure is a devil to master, even with the supplied booklet, but there's a helpful guide on the Cambridge Audio website. Installation complexities are easily forgiven when you hear it in action, and the 640H really sings. The CD drive is easily as good as the maker's standalone players, and uncompressed music transferred to the hard drive is just as solid (but quickly eats up hard drive capacity). The 320kbps and 256kbps compression settings are similarly impressive, taking up less storage space with barely any hint of degradation to sound quality. Noticeable quality losses begin with music transferred using the 192kbps setting, and complex tracks from Muse's Origin of Symmetry album are noticeably degraded and compression artefacts are clearly audible. Sadly, the 160kbps and 128kbps settings drop in quality and are unsuitable for music storage. The 640H music server is an impressive way to centralise and access all your music. Audio quality is respectable if you stick to low compression level settings, but awkward networking, quirky operation and the noisy disc mechanism mean that the Cambridge Audio 640H lacks refinement, and inexperienced users will struggle to get to grips with its full potential.